My go to Sahoor is a smoothie, bagel thin with cream cheese and some fruit (and don't forget your vitamins and lots of water). You can prep your smoothie the night before, esp if you have one of those handy "Rocket Blenders" with the individual cups. Put your fruits in the blender cup the night before (according to Mammy, you can store your prep ahead smoothie for about a week). In the morning all you have to add is the yogurt and liquid then blend! Throw in a shot of protein powder or powdered greens and your in business! 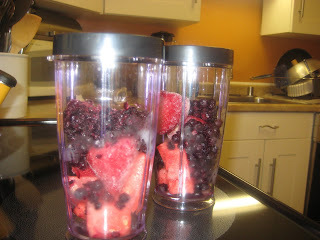 *If using a regular blender, make double the recipe and save the rest for the next morning, add some ice and re-blend! What do you do to make preparing Sahoor easier on you? ?